I like apple pie—especially fresh baked with ice cream—but if asked to prioritize all the desserts in the world, apple pie would pretty far down on my list of favourites. 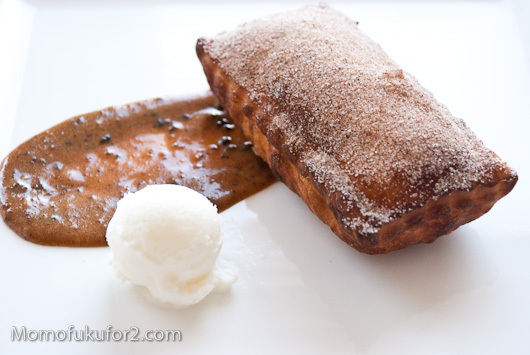 I was hoping Momofuku’s apple pie would be transcendental, but it was just a fried apple pie. 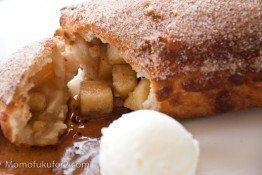 A good fried apple pie, but apple pie nonetheless. 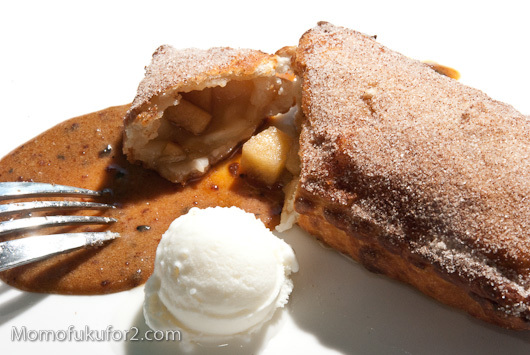 Chang’s goal with the fried apple pie was to evoke a memory of McDonald’s apple pie and I think he succeed. The filling was sufficiently gooey and while it wasn’t as oozy as McDonald’s, it had similar flavours. The mold for Momofuku’s apple pie is hard to find. I picked up a couple on my last trip to New York; it was the only place I could find them. I ended up making the dough twice. At first I used the cup measures in the book with the suggested amount of water in cups and ended up with goo. Chang describes the dough as “gummy” and “wetter and more overworked than you’d ever want a traditional pie or tart dough to be,” so I thought the goo would undergo a magical transformation in the fridge. An hour later, the dough was still a pile of goo. 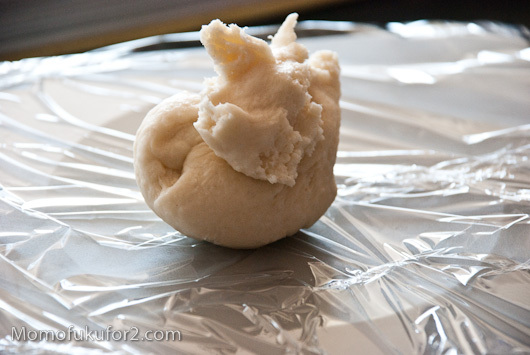 With the correct amount of water, the dough came together quickly and easily. A quick hour in the fridge and I was ready for pie making. The dough was sticky, but a little dusting of flour made it easy to work with. 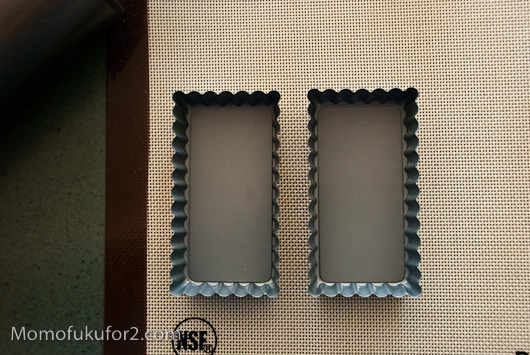 If you’re obsessed with the shape of Ko’s apple pies then little rectangular tart pans is what you need, but I think this recipe would work equally well as a kind of fried pop tart. I usually don’t have any qualms about deep frying, but when you’re putting a solid frozen pie in hot oil, you should be careful. The pie stays in the oil for 4-6 minutes and while it’s in there, keep an eye on it. I managed to burn one so badly we couldn’t eat it. Thankfully, second one turned out golden and crisp. I really liked the sour cream ice cream with the pie. The miso butterscotch, I found was a bit too rich for me. I still think the miso butterscotch would work on a savoury dish, but I didn’t like it so much with the cinnamonny apples. I guess I’ll have to keep looking for that transcendental apple pie. Any suggestions? Holy cow, that looks amazing! I’m not surprised about the weight measurements being off. I’ve found in the book that whenever Chang gives a weight measure, you should always use it, as the conversion between volume and weight is always way off (the chillies in the Rice Cakes w/ Spicy Sausage is a really good example of this, too). It isn’t transcendental, but I like cranberries or ginger – fresh or candied – in my apple pie. I tend to go for flavor bombs. I really love adding dried apples to apple pie. It gives a whole different texture and the dried apples have a much more intense taste. I try avoid ones with added sugar and I usually scale back the sugar called for in a recipe if I use some dried apples since they’re generally sweeter per cup. Also, just found this blog about a week ago, I’m really enjoying checking it out! I just take 6 granny smith apples, cut them into chunks, add juice of half a lemon. Toss apples in cinnamon, sugar and cornstarch. Brush a pie shell with egg whites, fill with apple mixture and dot really well with butter. Either put a lattice crust on top or just add some crumble and bake at 350 until crust is golden and apples are tender. Amazing! I wish all baking recipes were in weight measurements. It is far to easy to end up with a bad result with the volume measurements! When I did this professionally, we only ever used weights, and it ensured even results every time. my son and i were just discussing the “mc donalds apple pies”. we are not patrons of mickey d’s but i were talking about the foods of my childhood…and yes, i am embarrassed to admit it, i was a fan! i am going to have to make these! yum. where can i find the recipe? thanks! The recipe’s in the Momofuku book. I don’t post recipes from the book. 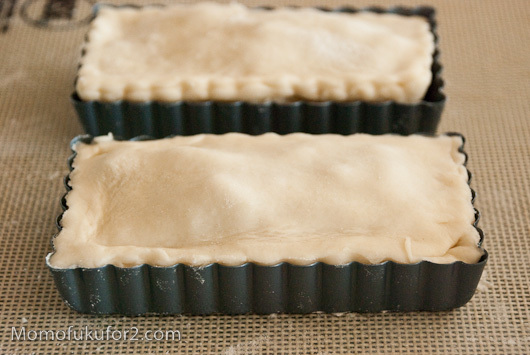 make a pie crust (I prefer 1 part lard to 1 part butter, but do what you like). mix 3 tbls of butter, 1 cup of dark brown sugar and 1/3 cups flour until it looks like crumbs. 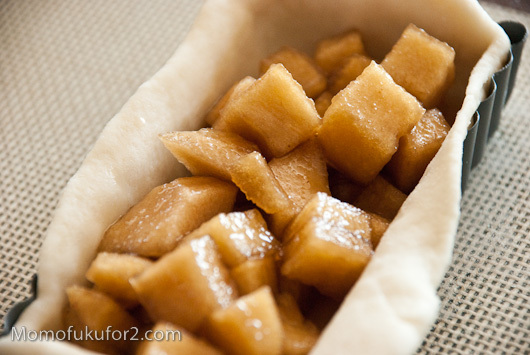 sprinkle half into the pie shell, and arrange sliced apples over it. mix 1/2 the remaining crumbs with 2/3 cups of cream, and pour this over the apples. 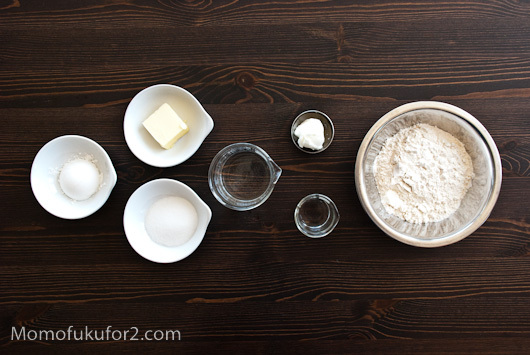 mix the rest of the crumbs with 3/4 teaspoons cinnamon and sprinkle over the top. bake 425 degrees for 10 minutes, then reduce to 350 for 30 minutes. Dude! Thank you much! I was getting so frustrated, because the dough was still a big soupy mess after mixing for 10 minutes. Now I know why. But what in the world? Why is the book so off? I understand being a little off but 1/2 cup of water vs. 1 cup and 1/4? There’s no recovery from that. where do you find these panS!?? !